Rick Chambers & Associates works directly with you to develop strategic, objective-based communications using the most effective and creative tools, including print, electronic, online and in-person, to build relationships with your stakeholders and get your messages heard. - Collaborative relationships with respected professionals in the field that allow us to handle projects of any scale. 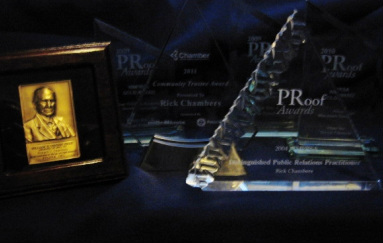 Rick Chambers & Associates, LLC, was founded by Rick Chambers, APR. Rick brings more than 30 years of experience in corporate communications, public relations and journalism. Rick began his career as a newspaper reporter, winning awards for investigative journalism and news reporting. He entered the public relations field in 1987, working in the pharmaceutical industry, where he gained broad experience in both internal and external communications, holding key leadership roles ranging from local community relations to global media relations. Rick holds a B.A. in Public Relations and earned Universal Accreditation in Public Relations (APR) status through the Public Relations Society of America. Achievements and recognition include Distinguished Public Relations Practitioner of the Year (West Michigan PRSA), Community Trustee of the Year (Kalamazoo Regional Chamber of Commerce), W.E. Upjohn Award (Pfizer Inc.), Premier Best-of-Show and Gold PRoof Awards (West Michigan PRSA), and was a two-time Gold Quill finalist (International Association of Business Communicators). As a journalist, Rick also received the National Editorial Leadership Award (Associated Collegiate Press), the Thomas E. Groehn Memorial Journalism Award, and multiple Michigan Press Association awards. Rick is a published author and screenwriter, and he has won several awards for his short stories.